I got back to Amsterdam yesterday morning. Phoenix was nice and sunny. Somehow, I forgot to take any pictures; so you'll need to take my word for it. The hotel had a "lazy river" (so lazy that some paddling was required) and a waterslide (tip -- assume luge position for maximum effect) and a mini-golf course (sadly lacking in obstacles). However, it was expensive cab rides away from the city; so the hive of Seattleites mostly did not stray far from our temporary home. The conference itself was pretty good: no one told me my posters were stupid, some of the talks were interesting, others were fun for back-row criticism value, and it was nice to see everyone from the office for a few days. Now I'm here again and the days are suddenly getting noticeably longer, which is nice and might be helping with the general avoidance of ultra jet lag. Also, since my return flight was completely empty (like the first flight, it was scheduled for a major U.S. television holiday -- first the Super Bowl, then the Academy Awards); so I was able to grab an entire center row and sleep for several hours on the way. The picture accompanying photo is from a train station here. 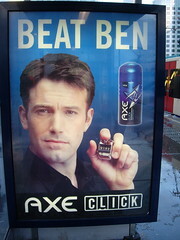 Contrary to what you might first assume, it is not a campaign to incite violence against Ben Affleck. Instead, it's his campaign to get you to spray AXE bodyspray all over yourself to lure women (and the occasional man, if the commercials that play in movie theaters are to be believed) to flirt with you so that you can keep track of their advances with a handheld counter. Er, maybe it sort of is a campaign to incite Ben-related beatings, too?